Located on the site where a palace of the first count of Barcelona once stood, Ohla Hotel truly sits in the historical heart of the city. The hotel was inaugurated in February 2011, having carefully preserved the building’s historical façade from 1920 and other listed elements including the main staircase. 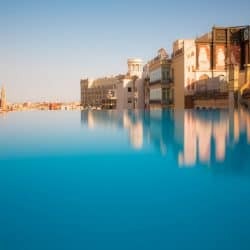 Yurbban Trafalgar Hotel provides an experience of what it is to enjoy the essence of Barcelona as a local. The 56-room vintage style hotel features attractive modern design touches. The Serras Hotel opened January 2015 in a historic building situated in the heart of Barcelona.During the restoration process, archaeologists uncovered part of the dock of the city of Barcino (Roman Barcelona) dating from from the 1st to 5th Century, which still remains under the hotel. The Cotton House Hotel is housed in a listed landmark built in 1879 by Catalan architect Elies Rogent, at the height of the textile industry in Barcelona. U232 Hotel is centrally located in the Eixample neighborhood amid the beautiful modernist architecture of Barcelona. On the hotel’s ninth and tenth floors, ‘Top Rooms’ offer private terraces with sweeping views over the city.